When my daughter started kindergarten, we had a short conversation about what it means to be a good friend. I told her that it's important to be kind to others and, they in turn will, hopefully, return the kindness. Tonight, out of the blue, she approached me and said, "Mommy, I've made friends with all the girls in my class." I smile and give myself a little pat on the back. And then she looks at me and adds, "even the weird ones." Now, first I must put this statement into perspective before you all start thinking completely negative thoughts about my parenting abilities. My daughter's class is not racially or ethnically diverse. She was just referring to hairstyles or clothes or mannerisms she observed in making this statement, but it still shook me. We had a discussion about how one shouldn't judge people for their looks and that what we see on the outside doesn't always reflect the person on the inside. I also explained that each and every one of us is different and special in some way and it is always important not to use words that might cause hurt feelings. When children start school, they must deal with all sorts of different social situations and they continue to develop their social skills. My daughter's school just started using the "bucket filling" philosophy as a way to encourage positive interaction. This is a good, simple start, but I think it is also important for parents to discuss situations and offer concrete explanations to help a child learn and develop socially. Also, learning how to forgive is just as important as being able to "fill a bucket." "At the party, I'm the only one who brought her little sister. Sana has to win all the games, and when she falls down during musical chairs, she cries like a baby." 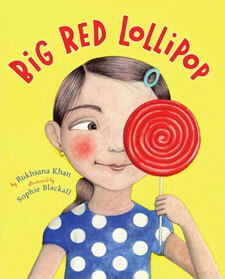 Tonight we read Big Red Lollipop by Rukhsana Khan, a wonderful picture book about hurt feelings, forgiveness, differences, and sibling interactions. 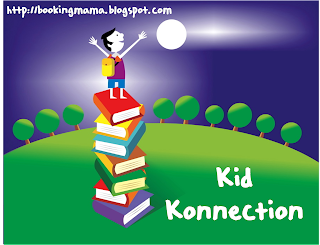 A school-aged girl named Rubina gets invited to one of her classmates' birthday parties. Excitedly, she skips home and tells her mom. Upon hearing the news, her pesky little sister, Sana pleads to go along. Now, normally the answer to this would be, "No," but Rubina's family is from Pakistan and her mother doesn't understand that taking other siblings to a party isn't exactly the thing to do. So, horror of all horrors, Rubina is forced take Sana with her to the party and her sister behaves miserably. On top of that, each girl receives a lollipop at the party, and Rubina saves hers for another day, but Sana discovers it and eats it. Rubina's mom doesn't have much sympathy and replies, "It's just a lollipop." Rubina, understandably bitter, later has the opportunity to be the better person, and the story ultimately presents a wonderful lesson of forgiveness, generosity and sibling love. I'm not sure my daughter understood all the points of the story, especially since she still thinks it is fun to take her little brother along with her to different events, but she completely understood that Rubina's friends no longer wanted to be with her after that party and she felt incredibly sad for her. (Blackall's illustration of Rubina in this part of the book is seriously heartbreaking.) My daughter also understood that it took a lot of kindness for Rubina to later do her sister a favor and forgive her for her actions. There's so much to discuss in this book and, all the more interesting, the story is from real-life (the author is Sana). Tonight, I chose to talk to my daughter about differences and how it makes people feel when you treat them differently. Other days we could easily talk about sibling relationships or greed or forgiveness. And, the illustrations by Sophie Blackall are outstanding. The bright red lollipop on the cover makes the book hard to resist picking up. Then inside the circle theme continues in the clothes and illustration insets. Circles for a circular story -- brilliant! This book has received starred reviews for a reason and is listed in A Fuse #8 Caldecott prediction post. "Catkin sneaks through the grass. He sees something shiny and small. Kerik-kerik. Kerik-kerik. Catkin hops..."
The first thing that catches your eye with this one is the lavishly illustrated pages by Julie Paschkis. The illustrations are beyond beautiful, with busy and bright orange borders and a folk art (almost like rosemaling), swirling design style. Even my toddler proclaimed, "Wow, that's pretty," when he saw one of the final pages. Yes, toddlers do pay attention to details and like a well-illustrated book. The story by Janet Lord is pretty straight forward and simple. Catkin, an orange and white cat, jumps off a little girl's lap and explores the outdoors, stalking various creatures in nature. He tries his best to catch a cricket, frog, mouse, snake and bird, but the creatures all play a pretty good game of hide-and-seek, and Catkin gets himself into trouble. With fun animal sounds (squeak, squeak; garrump, garrump; etc.) 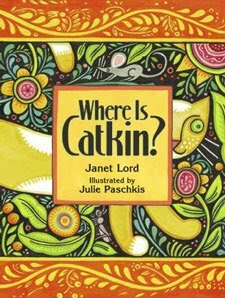 and colorful illustrations, Where Is Catkin? is one of the neatest search-and-finds we've read lately. 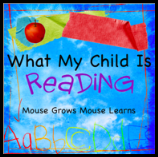 Link up your weekend book posts at What My Child is Reading at Mouse Grows, Mouse Learns and/or Kid Konnection at Booking Mama. 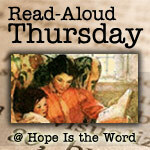 And, I missed Hope Is The Word's Thursday link-up, so I'm linking today's post even though it's not Thursday. Those look very interesting. Sibling relationships can be challenging, especially when you factor in outside friends - I think we'll have to check that one out. We haven't read either of these books. Thanks for the reviews. Siblings and birthday parties are a hot topic in my house. I just put both of these on our list. Thanks! Both of these books sound great. I definitely want to read that first one with both of my kids. It sounds like a good lesson. Big Red Lollipop looks great; I'll put it on my list for when Boo is a little older. And speaking as the parent of someone who will almost certainly be one of "the weird ones", more parents taking the time to explain and ensure their kids understand that just because someone looks or acts atypically doesn't mean you shouldn't be nice to him/her or care about his/her feelings would be excellent. These books are both new to me and look terrific! Thanks for sharing!